In an instant, the world changes. For a moment, it's not real. I want to hit 'undo' on the last two seconds, to force myself awake, to revert to the world as it still is at the tail end of my window of consciousness. But this is immediate and it is final. During the firefight I'd overlooked damage to life support. The alarm sounds too late, and by the time I can get the oxygen back on, most of my crew is dead. An entire strategy, around boarding enemy starships and stripping them for parts, disintegrates. Suddenly, all of the work I've done to build the Shivan - tough, but poorly armed - is irrelevant, and all of my future plans are liabilities. I want to quit. For a while, I do. Even if you're good at Faster Than Light, this kind of disaster is routine. 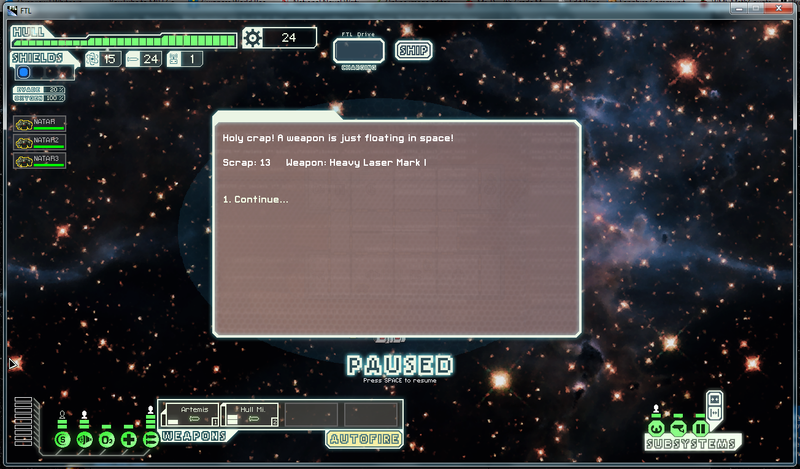 A lucky hit to the shield generator cripples your otherwise-indestructible ship. Giant alien spiders eat your crew. A navigation error strands you in front of rebel cruisers. There are no savegames. This is a game about recovering from catastrophic fuckups. But things are never as good, or as bad, as they seem. You can play intelligently, carefully and diligently for mediocre results, and then have the entire run turned around by a lucky break that you didn't deserve. That's if you still had the will to carry on, after the last unlucky break that you didn't deserve. The Shivan isn't a boarding ship any more. I redirect power from teleporters to weapons, and prepare to jump.